Basta con añadir los archivos de libros electrónicos con el programa para crear su propia biblioteca. 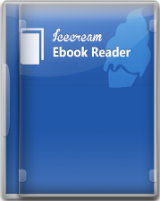 Icecream Ebook Reader es un lector de libros electrónicos con un moderno interfaz intuitiva Que apoya ePub, MOBI, FB2, PDF, formatos CBZ y CBR. Categorías personalizadas son útiles para la organización de los libros más eficientes ". Los libros adquiridos por la biblioteca se pueden ordenar por formatos, por Favoritos (el libro se puede añadir a favoritos y se retira) y recientemente leídos. El progreso de la lectura de cada libro permite a los usuarios guardar en la lectura desde el punto en que el libro fue dejado anteriormente. Marcadores de las páginas necesarias está disponible para cada libro junto con la visualización de su contenido. Barra de desplazamiento de navegación en la parte inferior de las páginas de los libros es una gran manera de fácil acceso las páginas necesarias del libro. Es posible ampliar y disminuir las fuentes de archivos ePub FB2, MOBI y, cambiar la fuente y el color del texto. El cambio de los colores de fondo y workground del programa se puede hacer a través del panel de configuración de helado lector de libros electrónicos. 1. As a library I will continue to use Calibre as it is more versatile. Especially the synchronization with ebook readers and tablets is missing. 2. As a reader it is much better and faster than Calibre. I tested with 100+MB ebooks. So my personal decision is to keep both programs but set Icecream Ebook Reader as my default reading software. My test results: 1. As a library I will continue to use Calibre as it is more versatile. Especially the synchronization with ebook readers and tablets is missing. 2. As a reader it is much better and faster than Calibre. I tested with 100+MB ebooks. So my personal decision is to keep both programs but set Icecream Ebook Reader as my default reading software. Can't make font bigger, it's too small to me. ew, there is 'A' button to increase the font size. For those who were wondering. I scanned my documents folder & it loaded PDF files just fine. I was able to read the documents without any problems. I then deleted an old file from the list. I then went to my documents folder & found the original PDF was still there. So it must just delete the file from the library listing and not the original file from the computer! I wouldn't worry about losing your original by deleting from the library list. That being said, you must go to the sorce to delete the file if thats what you want to do! Hope this helps by clearing a few things up! Always the same problem with programs like this. They never say if adding a book to the library creates a second copy or just points to the original on your computer. I have over 1000 epubs. Why would I want a program that makes duplicates? There is the statement on their website "...click on the “Open” button and the book will be imported to the program." Does this mean it actually creates a second copy? Always the same problem with programs like this. They never say if adding a book to the library creates a second copy or just points to the original on your computer. I have over 1000 epubs. Why would I want a program that makes duplicates? There is the statement on their website "...click on the “Open” button and the book will be imported to the program." Does this mean it actually creates a second copy? Wolf, I think a program should address such an important aspect. Why waste the time and take the chance that a program will delete books if uninstalled. I like to keep my epubs on a thumb drive and read wherever I am. A portable version to put with the books would be nice.